The morning was mild. Stratocumulus from the northeast was slowly dissipating. Cumulus developed on the mountains during the day. Some isolated cirrostratus was developing from the northwest to west. There were indications thunderstorms might develop later. Large cumulus developed into weak thundery showers during the early afternoon period. It seemed to indicate that thunderstorms would develop on the mountains and remain there. The weak anvils were directed eastwards but very weak. I decided to head home and wait to see if action developed later. 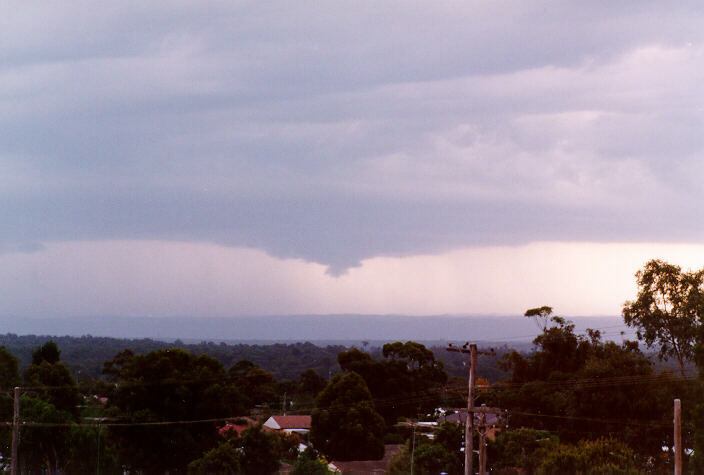 From about 3:30pm onwards, anvils from developing thunderstorms approached over thundery showers from further to the west of the Blue Mountains escarpment. Major cumulus and cumulonimbus developed to the south and southwest as these storms approached. One particular cluster of large cumulus began to grow adjacent to an established cell to the southwest. Some major towers were observed with the sun hidden behind cirrostratus and altostratus: the remnants of decaying anvils. The development intensified and I frequently observed its progress. I was waiting for the right moment to know when to leave for a brief chase. After all, it was heading my way. 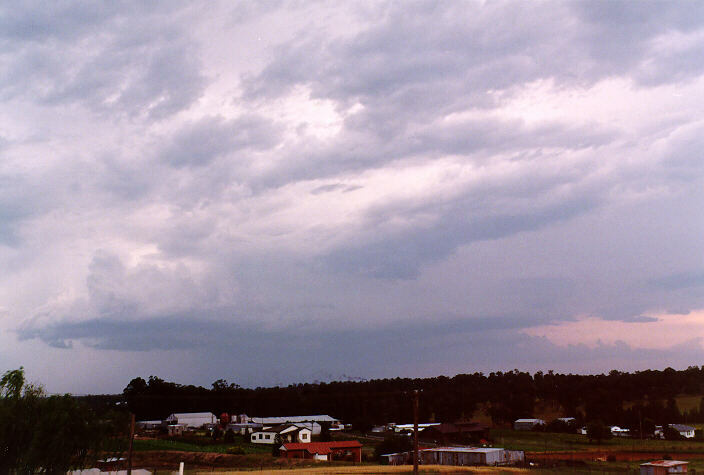 Another major cell to the north had developed and was heading for the Central Coast and seemed to indicate heavy precipitation and possible hail. Around 5:15pm, I took a couple of photographs of an archus cloud developing on its southern side. 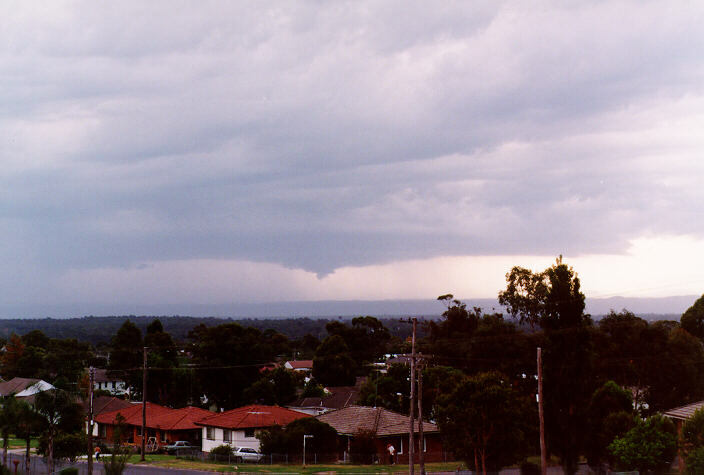 With the main storm edging closer from the southwest and moving east, I finally decided to go to a high vantage point in Riverstone (the next town from Schofields) which had a good westerly view. 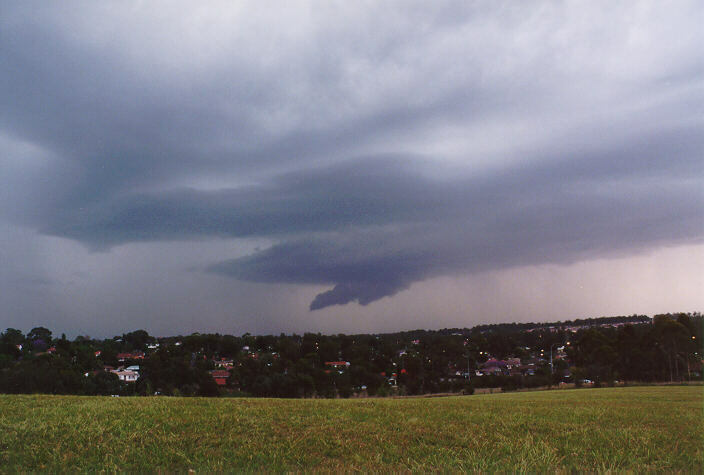 I was astonished to find that a lowered cloud section had developed at the rear of the storm with heavy precipitation, most probably hail as well as heavy rain falling from this storm. Behind the lowered base was lighter precipitation illuminated by the sun. 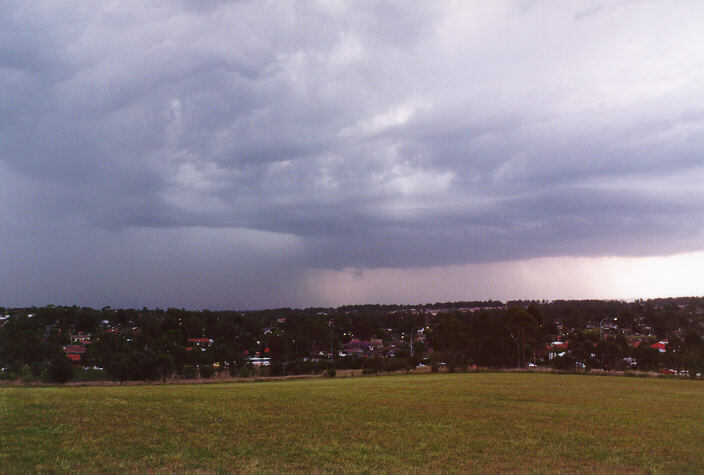 I decided to head for Rooty Hill which would bring me closer to the action and still on the northern side of the thunderstorm. I don't think I have ever run up the hill so fast. I seemed to have so much energy with the adrenaline rush. 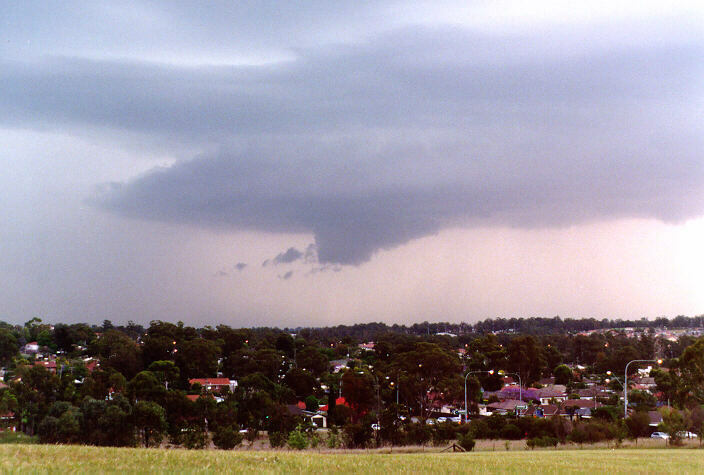 The thunderstorm was probably around 10 kilometres away. The heavy precipitation cascade displayed a spectacular light green tinge. Lightning was becoming more frequent and as I took photographs of the various features, I tried in vain to capture a daytime lightning bolt, although I was unsuccessful. 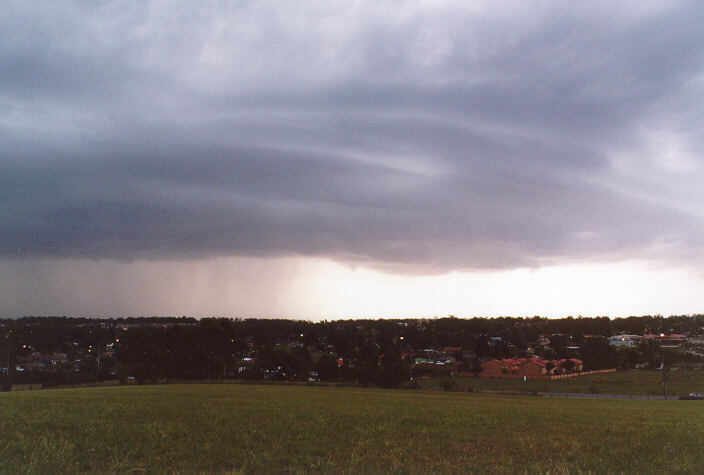 The lowered section had reappeared as the storm approached to within kilometres of the hill. So I took more photographs of the main features. At one stage I noticed that there was slight circulation in a counter clockwise direction looking from above associated with this lowered cloud base. 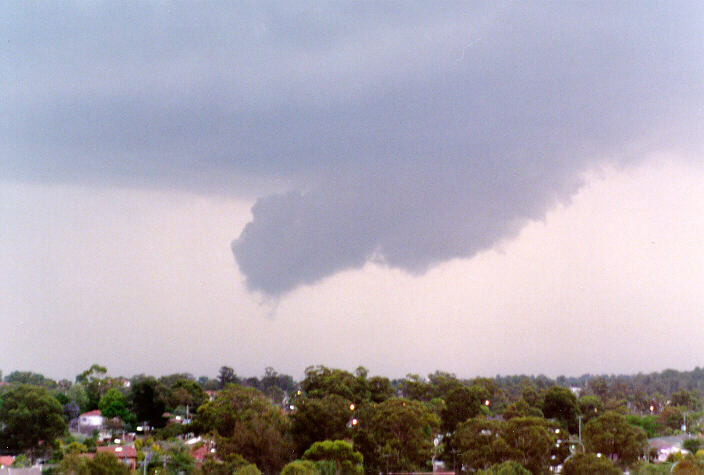 I am uncertain at this stage whether this was a wall cloud or just an archus cloud. 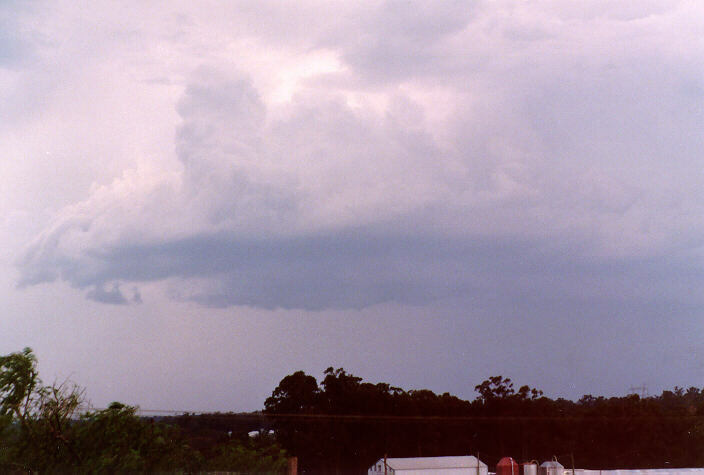 A band stretching north had developed connected to the lowered cloud base of the storm. It was because of this that I had to retreat from the hill. Light rain had begun falling and a hail cascade was developing out from the main cell along this band. From here, I travelled to Michael's place for shelter. I observed some very severe lightning bolts and some heavy rain in that area. Unfortunately, I missed an opportunity to photograph a lightning and rainbow simultaneously. This also meant that the brief chase was over. 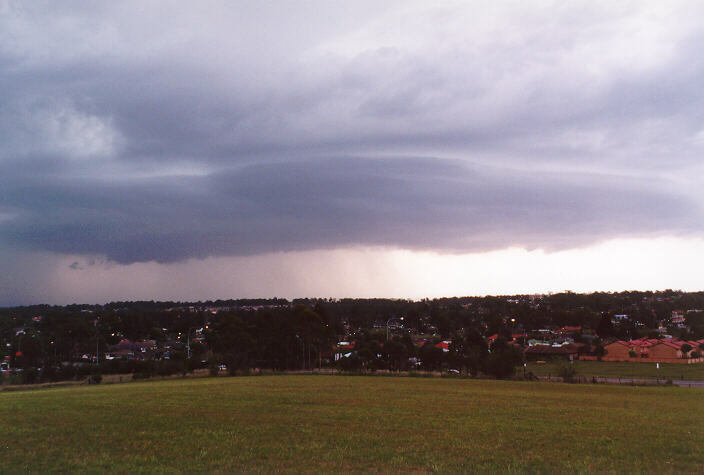 Later reports suggest hail was reported at Marayong, Quakers Hill, Rooty Hill, Greystenes with a hail swathe through Lalor Park, Seven Hills, in particular Prospect where hail fell for 15 to 20 minutes. Hail size seemed to be less than 2cm. 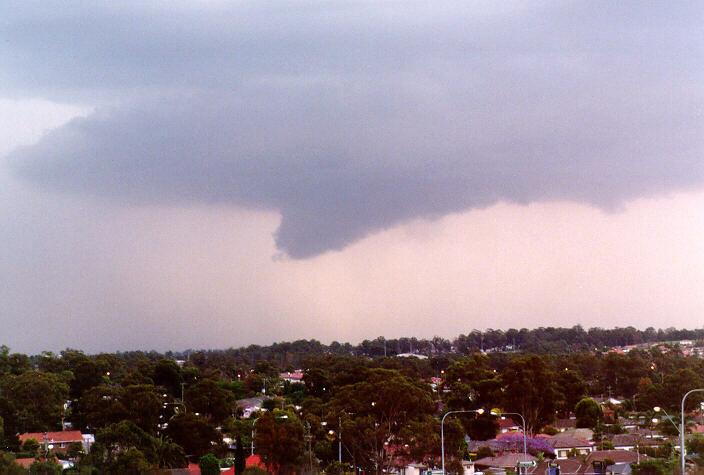 There were many blackout reports in areas affected by this storm. Of course, if anyone has photographs, video footage, newspaper articles or information and accounts about this storm (or any storm) and would like to send it along, we would very much appreciate it.